On the Levaque Tower they are near the pinnacle, discernable from the street, but not in detail. 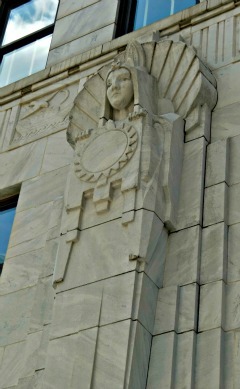 On the former Ohio Supreme Court Building they stand guard at either end. At the New India Assurance Building they guard the entrance from above. As in the other buildings they are helmed. 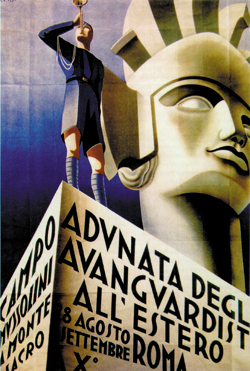 They all resemble this guy in the background of this poster. He appears to be a monumental statue on top of a building. 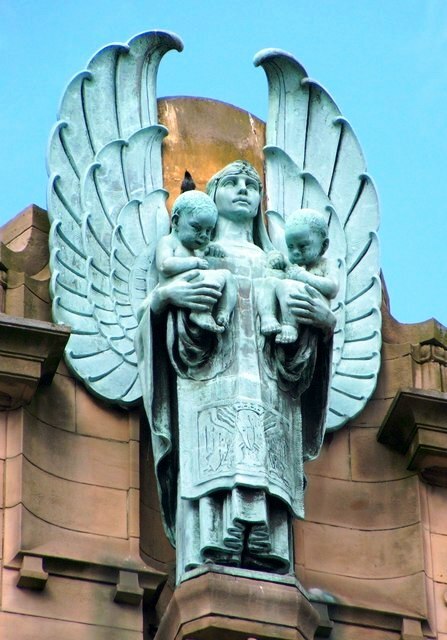 It makes me wonder what was going on in Art Deco that this type of guardian figure became a focal point on these different buildings. It is possibly something that arose out of some archeological discoveries. The basic shape of the figures on the Ohio Supreme Court building reminds me of the sarcophagus holding King Tut. On the other hand, none of the details look Egyptian. The Gothic churches had their gargoyles, and their statues of saints. Classical temples had various heroes decorating their pediments. None of those seem anything like our friends above. There is a precedent from Art Nouveau. 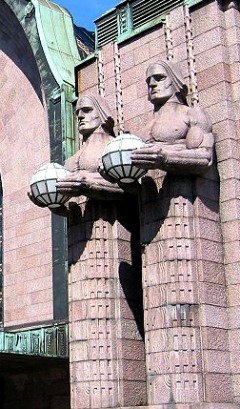 Eliel Saarinen created these lovely guys for his railway station in Helsinki, but that was just a few years before in a style closely related to Art Deco. 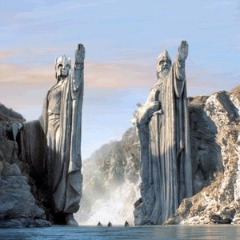 What it really reminds me of are the Argonaths, the guardian figures as the river crosses into the realm of Gondor in the movie adaptation of “The Fellowship of the Rings”. 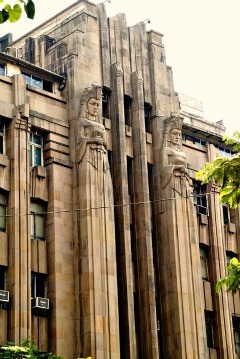 Since the movie was much later than these buildings it just suggests that the artist involved in this aspect of the film had some exposure to these Art Deco guardians or their close cousins. This started me searching the internet for any similar characters. 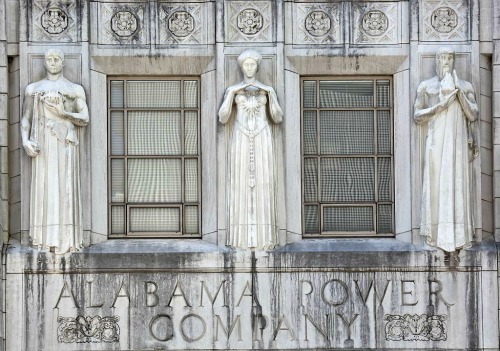 Most Art Deco buildings used a lot of low relief carvings rather than statues, but there are a few buildings that this type of ornamentation. Mostly the statues lack the look of a sentry that I first noticed. You have the usual collection of saints at churches. 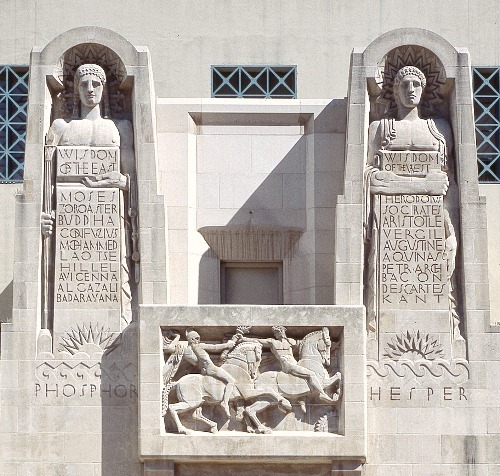 Some governmental buildings have figures representing law, or justice or liberty. An occasional building will go with a full-Gothic gargoyle adoring the heights. The pictures below are what I was able to collect from my internet journeys. 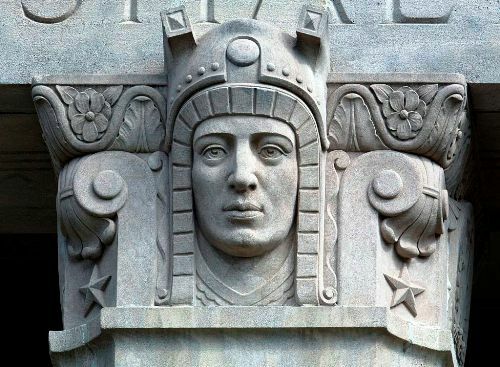 This man adorns a capital atop a column in a war memorial in Mississippi. i thought this was a lady, but I think I am seeing some rather muscular, bare shoulders. 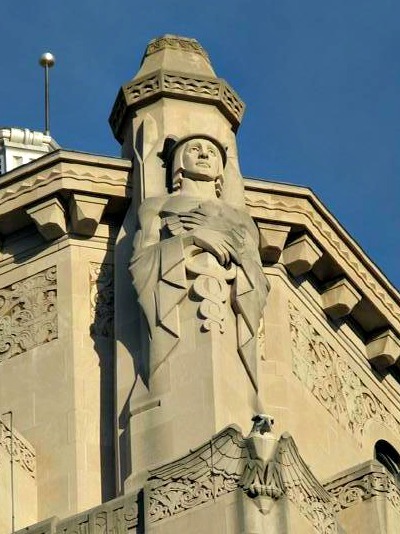 Either way, he/she stands atop the Times Star building in Cincinnati, Ohio. Perhaps my favorite. These three seem quite ethereal, like ghosts floating through the walls. In Nashville they have an Art Deco courthouse and this guy provides security. He looks pretty classical, but check out the funky windows next to him. 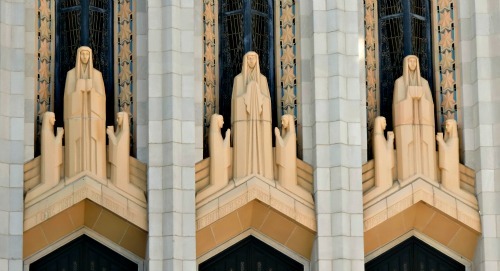 In Tulsa they have this awesome Art Deco cathedral, the Boston Avenue Methodist Church. The front has two sets of statues, the one group atop the other, as shown here. Click on the photo above to see the whole of the LA Public Library building. It is quite lovely. It looks like an old Spanish Colonial building, but with a slight modern edge. Here the statues are representing various aspects of learning. There are also statues on the roof of Shakespear and Goethe - but I could not find any good pictures to show you. 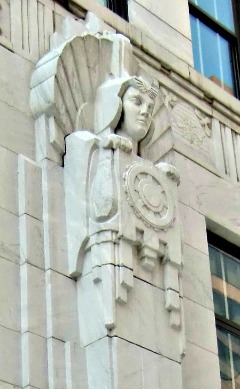 Here is a fellow standing guard next to the entrance of the appropriately named Guardian building. He has a friend on the other side of the entrance. The entrance is Mayan influenced, although I don't think this guy looks Mayan-inspired. 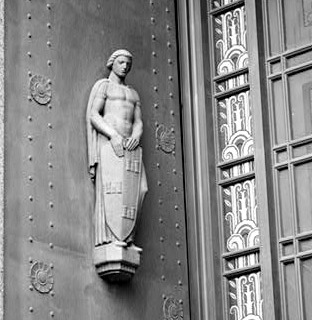 Compare the folds of his clothes with the folds on the guards at the old Ohio Supreme Court building shown above. Very similar, as is the shape. He is elongated and seems to come down to a point. The difference is in the way he seems to fade into the wall as you go down, whereas the Supreme Court guards stayed in relief. 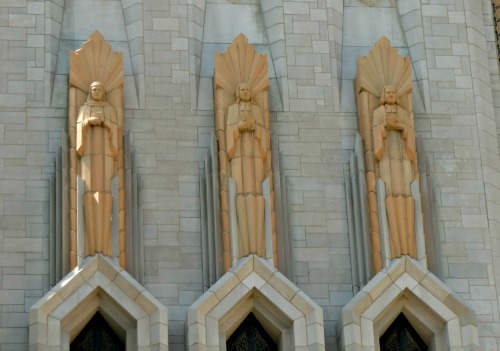 See Art Deco and Archaeology for a wider view of the entrance.